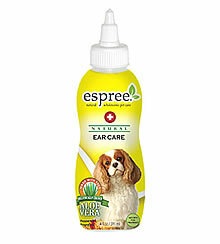 Espree's Medicated Ear Care is a special blend of Tea Tree Oil, Eucalyptus and Peppermint Oils which quickly dissolve odor causing ear wax build-up in the ear canal. 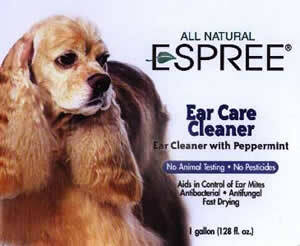 The residual benefits of these natural oils and active ingredients act as an antibacterial, antifungal agent that also aid in the control of ear mites. DO NOT USE ON CATS.